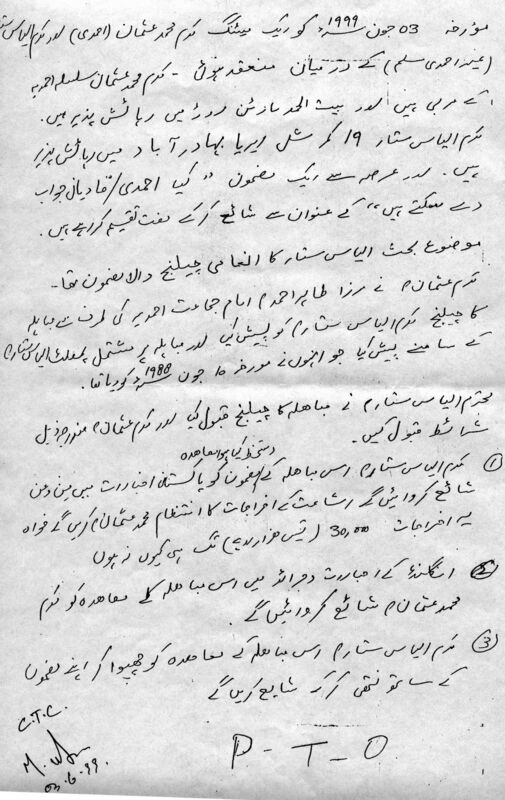 On 2nd November 1999 Anti Ahmadiyya Movement gave a final notice to Mirza Tahir that unless he repents in 8 days, he will witness the hell sign. His Press and Publication secretary, Rasheed Chaudhary wrote back saying that once again the Satan has misguided us into believing the Mirza Tahir is being sick. On 11th November a local daily newspaper wrote that Mirza Tahir had suffered an attack of paralysis. Question is why this lie by the Press and Publication Secretary? Following is the reason. On 3rd June 1999 a meeting took place between Mr. Usman Qadiani, a murabbi of Jamaat Ahmadiyya and resident of Bait-ul-Hamd - the Ahmadiyya headquarter on Martin Road Karachi and Mr Illias Suttar, a Muslim resident of Commercial Area, Bahadurabad, Karachi, who has been distributing a leaflet "Can Ahmadis Answer" for a long time. They were discussing the same leaflet "Can Ahmadis Answer", which had been haunting Mirza Tahir and Jamaat Ahmadiyya for over 20 years. On that fateful day, the 3rd June 1999, having failed to give a satisfactory answer to Mr. Illias Suttar's leaflet, Mr. Usman Qadiani gave a challenge of Mubahilla to Illias Suttar on behalf of Mirza Tahir, the Imam of Jamaat Ahmadiyya. Mr. Usman presented to Illias Suttar the printed challenge of Mubahila by Mirza Tahir (of 1988 and renewed in 1998). Mr Illias Suttar immediately accepted the challenge. 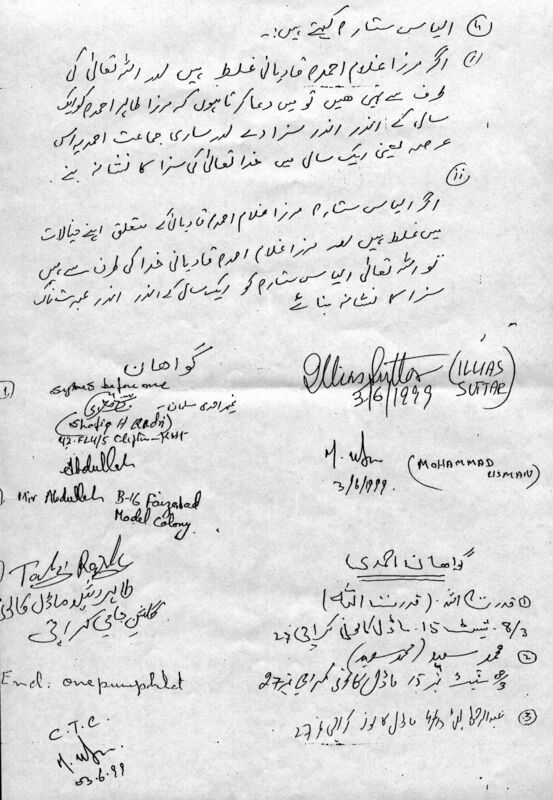 The conditions were duly written down and signed by both sides in the presence of witnesses which is attached here in original urdu language. The mubahila was printed and widely circulated by Illias Suttar. In the end of July 1999, Jamaat Ahmadiyya had its Jalsa Salana, the 34th annual gathering in Izlamabad in Surrey, England, UK.Mirza Tahir endorsed the occurence of mubahila with Illias Suttar and 18,000 attendees jointly invoked the curse of Allah upon the liar. Although the Mubahila was offered by Mr. Usman on behalf of Mirza Tahir but in his speech in the Jalsa Salana, Mirza Tahir shamefully lied that the Mubahila was given by Illias Suttar. However, instead of naming Illias Suttar he gave him the titles of "Karachi ka Jaahil", "Lalloo Panjoo", "Airaa Ghairaa Nathoo Khairaa". What other language can one expect from the Khalifa of Mirza Ghulam A. Qadiani whose obscene language for his opponents was also legendary. Again Ata-ul-Mujeeb Rashid led the Friday prayers. Mirza Tahir did not have the strength to lead the prayers. AlFazl International kept informing its readers about the progress of Mirza Tahir's health. A tight lid was kept on the nature of Mirza Tahir's illness. But the cat ultimately came out of the bag. Mirza Tahir had an attack of paralysis. However Qadiani Media is keeping mumb on this issue. WHY? Because they know the implications. If they admit that Mirza Tahir had an attack of paralysis, that would mean that Mirza Tahir had been afflicted by the curse of Mubahila. That would be disastrous for the whole Jamaat. Readers are once again reminded of the story of (one-sided) Mubahila between Mirza Ghulam Ahmad Qadiani and Dr. Alexander Dowie of US. When he died after sustaining an attack of paralysis, Mirza Ghulam rejoiced at the defeat of Dr. Dowie and published pictures of his paralysed body in his book, Haqeeqat-ul-Wahi, proclaiming victory in Mubahila. Is this what Jamaat Ahmadiyya and Mirza Tahir scared of? But how can they avoid what is written in the book of Allah? Wassalamun 'ala mun ittaba'a alhuda - Peace be on those who follow the hidayah.